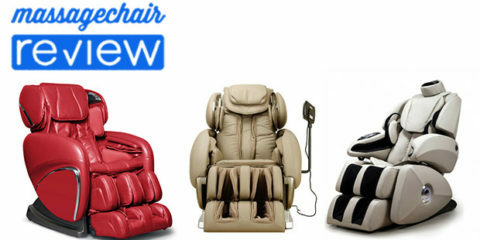 Osaki, a trusted name in massage chairs, keeps improving its technology to deliver more value. 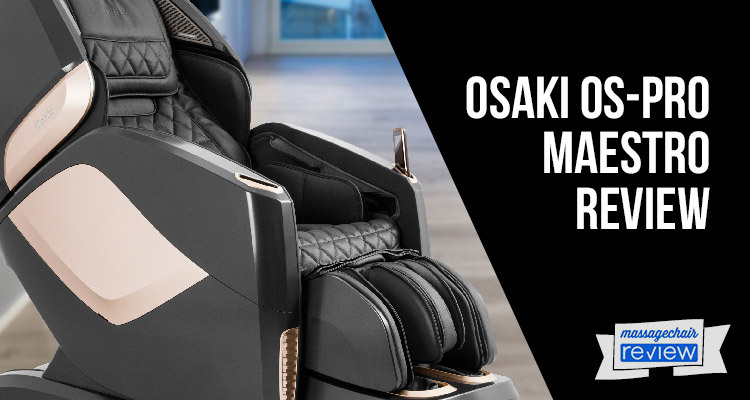 We had the absolute pleasure of testing the Osaki OS-Pro Maestro, and were in awe of many of the advancements, from a Bluetooth sound system that is second to none to a leg and calf massage with heat and kneading rollers to soothe achy muscles. 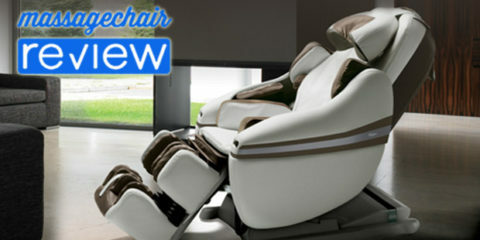 Read our Osaki OS-Pro Maestro review to hear about our favorite features in this revolutionary massage chair. 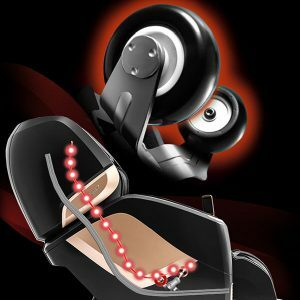 With advanced Japanese roller technology two years in the making, the Osaki OSiPro Maestro delivers the most human-feeling massage on the market today. The quad rollers provide a beautifully intense, precise massage that targets problem areas on your neck, back, and shoulders with ease. The 4D technology allows for a multitude of adjustments, including eight separate forward-back settings, five intensity adjustments, five strength adjustments, and five-speed adjustments. These settings automatically change based on the program you select, but you can also adjust them manually through the intuitive LED touchscreen controller or via an easy-to-access button on the inside of the chair’s arm. More massage chairs today are adding heating pads around the lower back. But the Osaki OS-Pro Maestro uses heated rollers to deliver soothing warmth from the neck to the glutes. Like massage stone therapy, the rollers help loosen muscles with targeted heat. 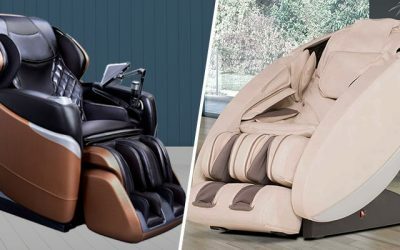 With a 53-inch, extra-long L-track, the Osaki Maestro is a true full-body massage chair, delivering a humanlike roller massage from the back of your neck down to your upper hamstring muscles. 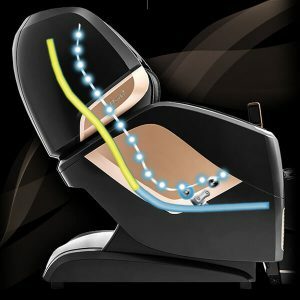 The S-track contours to your spine for a more comfortable massage, enhancing the capabilities of the 4D rollers for the most comfortable experience possible in any massage chair today. Like most of today’s high-end massage chairs, the OS-Pro Maestro uses body scan technology to detect pressure points in your neck and back for a customized massage. The Maestro scans the body twice for accuracy and also enables manual adjustments once the massage has begun. We were especially impressed by the compression massage the Maestro delivers. The hip airbags place pressure on the outside of the hip and enable the twisting program to do its job and loosen tight muscles for pain relief or to enhance pre-workout flexibility. The shoulder airbags do the same for the upper body. 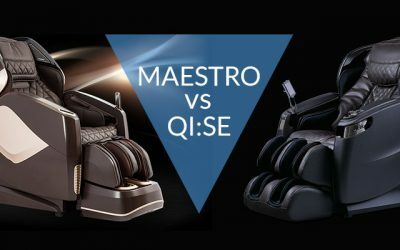 Unlike many massage chairs, the Osaki Maestro has segmented airbags for the hands and arms, delivering a delightfully invigorating massage to the forearms and palms. 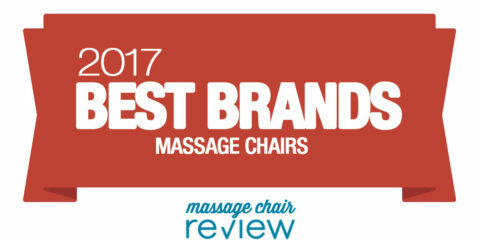 The foot and calf massage stands out as the best in any chair, deserving a special mention in our Osaki OS-Pro Maestro review. The enclosed Ottoman scans your legs and feet and automatically adjusts to the correct height. 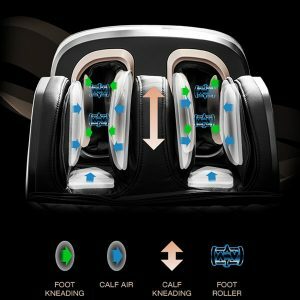 The airbags deliver interior air pressure to stretch and loosen calves, while the components oscillate to rub your calves for an invigorating experience. 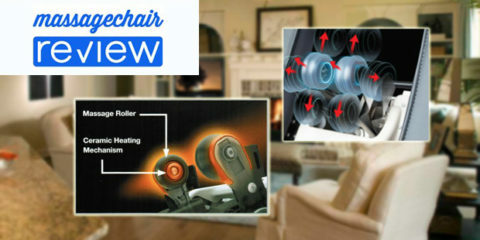 The enclosed ottoman places pressure on the arch of your foot while the rollers deliver a comfortable shiatsu massage. If you work on your feet all day, this chair will make you forget your aches and pains. With eight automatic full-body massage programs, the Osaki OS-Pro Maestro has a choice for everyone, including massages designed specifically for male or female bodies. But the selections go even deeper. Aside from these eight massages, you can choose pre-programs that target your whole body, your neck and shoulders and upper back, or your lower back and glutes. Within those areas, you’ll get an additional selection of four massage programs. You don’t have to create your own massage if you want to target just one area of your body. Best of all, you can choose these selections via the intuitive touchscreen LCD remote or through conveniently located buttons on the arm, which allow you to control power, pause the massage, select from two zero gravity settings, make adjustments to the 4D rollers, and choose an automatic program. Science shows that zero gravity positions help reduce blood pressure, increase circulation, and alleviate stress. The Osaki Maestro offers two zero gravity settings inspired by NASA technology. 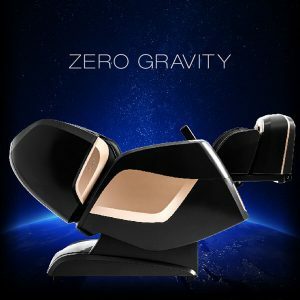 You can feel extreme weightlessness and a more powerful massage, or enjoy the benefits of zero gravity while still being able to watch TV or hold a conversation. good you could use it to fill the room with music even when you aren’t getting a massage. Immerse yourself in your favorite meditation soundscapes, music, or audiobooks while you enjoy your massage. You will only need 5″ of wall clearance for the Osaki Maestro, as it has a space-saving design where it hugs the wall when you recline. As the Maestro reclines, the chair will slide forward conserving space. As customizable as today’s massage chairs are, not every chair fits every person. Tall people over 6’3” may not fit comfortably in the Maestro. If this is you, we recommend the Human Touch Novo-XT, which fits users up to 6’9”. 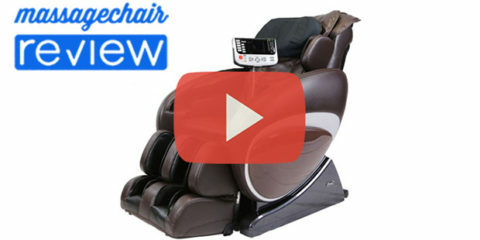 Retailing for just under $9,000, the Osaki Maestro is a top-of-the-line massage chair with a premium price. Let’s be honest. Not everyone can afford this massage chair. The Osaki OS-Pro Maestro offers the best value in its class. We recommend it over other models, like the Infinity Celebrity. 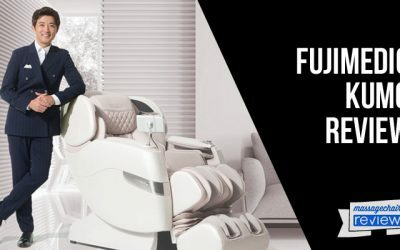 If you are looking for a more budget-friendly massage chair, consider the Osaki OS-Pro Maxim, a zero gravity massage chair with 12 different massage programs. The Ogawa Active L, which has an extra-long L-track and two-stage zero gravity for under $5,000, is also a good choice. 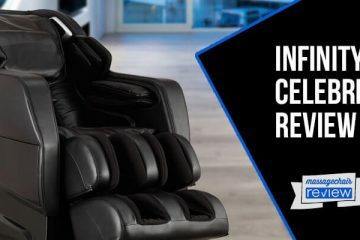 If you have your heart set on the Maestro after reading our Osaki OS-Pro Maestro review, remember that many online massage chair retailers also provide easy financing options. If our Osaki OS-Pro Maestro review hasn’t made it clear: We have not found a chair we like better than the Maestro, for any price. 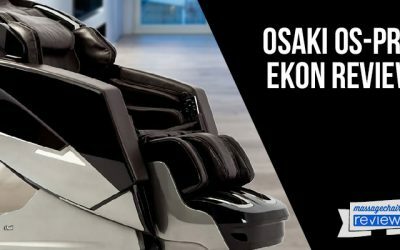 Osaki builds upon years of proven technology and enhances the 4D experience with multiple settings, highly effective quad rollers, zero gravity, and an SL track that delivers all you could want in a full body massage. 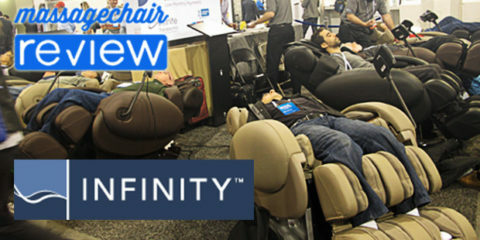 The Bluetooth Amphitheater speakers raise the bar for sound quality in massage chairs. 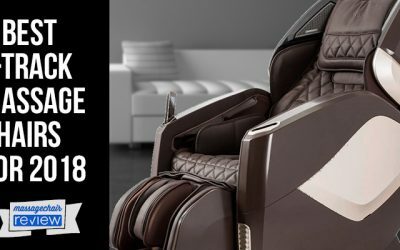 When you are ready to make an investment in your health and enjoy at-home massages every day, you can’t find a more feature-packed, high-quality massage chair than the Osaki OS-Pro Maestro.